Among retro faves like Shake ‘N Bake and Hamburger Helper, one of my family’s quintessential recipes is the straightforwardly named Linguine And Broccoli. 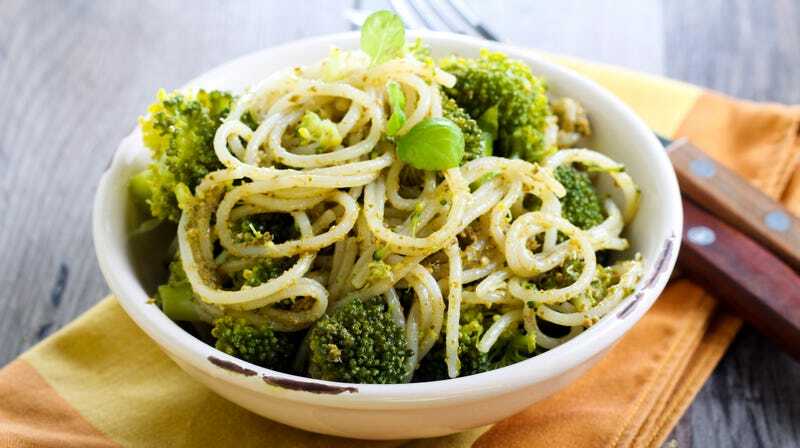 It’s a light yet hearty pasta dish tossed with cooked broccoli, olive oil, anchovies, and garlic. We cooked it in every season, any day of the week—and you should, too. My father immigrated to the United States when he was 21 years old, bringing with him recipes like this one, which he acquired from his own mother’s small seaside kitchen in southern Italy. When he cooked it on say, a Wednesday night, our suburban Chicago kitchen filled with the pungent aroma of frying garlic. Actually, scratch that—it filled the whole house and perhaps the whole block. It was also common that on Thursdays and maybe even Fridays, my backpack or coat would smell like fried garlic when I went to school. I have been eating this meal since I was in a high chair, and every time we sat down to a bowl of it, my dad would say, without fail: “Someday, you’re going to go to a restaurant and pay $20 for this dish.” To this day, when we go to a restaurant and see it on a menu, we snap a photo because he spoke the damn truth. It’s extra funny because this is a cheap meal, just pasta and veggies and anchovies. The ingredients are simple, inexpensive, and when they come together, it’s a beautiful symphony of subtle flavors and rich textures. There are a few protein options, like shrimp or chicken, you can incorporate if you’re not going the meatless route. But the way it’s intended to be served is with anchovies. While I’ve marked them in the recipe as optional, I consider anchovies to be an essential component. With al dente linguine and velvety broccoli, anchovies add a complex saltiness and a baseline brininess. In short, anchovies add dimension. I would be remiss if I didn’t include a pro tip: Make enough for leftovers. This is a dish that tastes even better the next day—you can even pack it for school lunch. Trim broccoli into florets. Fill a large pot with water and salt liberally, then set to boil. Once the water is boiling, cook the broccoli until very tender, about eight minutes. Remove and set aside. Refill pot with water and salt, bring to boil, and add pasta. Meanwhile, add olive oil and garlic to a small frying pan over low heat, cooking until lightly browned and fragrant. When pasta is al dente, drain pot, retaining a little water, then add the broccoli back into the pot with pasta. Turn frying pan back on to medium. Add desired amount of chopped anchovies to the pan for a minute. Then, slowly pour the warmed olive oil-garlic-anchovies combination into the pot of pasta and broccoli, and toss. Season with salt and pepper to taste. Serve immediately.